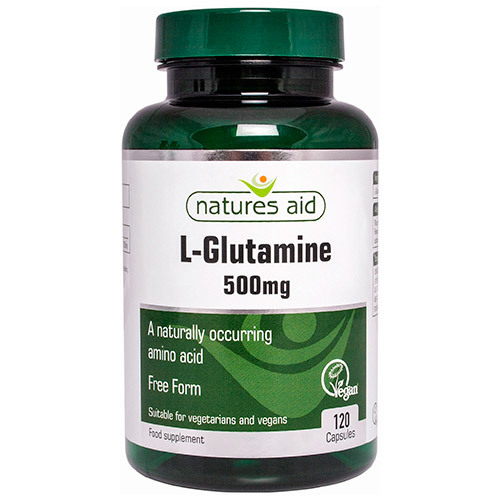 Natures Aid L-Glutamine 500mg - 120 Capsules - A naturally occurring amino acid that is free form and suitable for vegetarians and vegans. Natures Aid single herb products have been developed using standardised herb extracts which offer a guarantee of purity, potency and quality. All of our products are free from Artificial Flavours, Colours and Preservatives are Gluten Free and are Non-Irradiated. Hydrogenated fats have the same identity as saturated fats and have been linked to an increase in many diseases. The Natures Aid range is free from hydrogenated vegetable oil. Natures Aid wherever possible use Chelated vitamins and minerals for effective absorption into the system. Chelated minerals are most often recommended to guarantee the intake of essential minerals. Many of our larger tablets are coated to enable easy swallowing. Wherever possible Natures Aid only use ingredients which are suitable for vegetarians and vegans and it is clearly indicated on each product label. Take 3 capsules a day on an empty stomach. Below are reviews of Natures Aid L-Glutamine - 120 x 500mg Capsules by bodykind customers. If you have tried this product we'd love to hear what you think so please leave a review.